Seven members of the school’s Strategy Club are set to take part in the first heat of the Games Workshop National School League in Shrewsbury this Saturday. 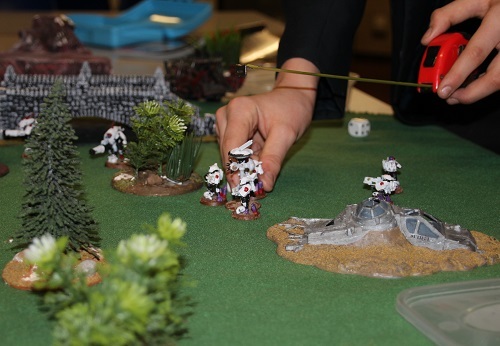 At the event, our students will compete against pupils from other local schools, in a bid to qualify for the West Midlands Regional Final at Warhammer World in Nottingham in March. The miniature wargaming experience sees players pit their armies against each other using different vehicles and warriors, with outcomes of battles being determined by dice rolls. This is not a game of chance, as there are a wide range of factors that need to be considered and planned for, which requires players to think strategically and mathematically. Strategy Club, led by Mr Clayton, takes place after school on Fridays, and the group enjoys playing several different games. Warhammer 40K is certainly one of the favourites, with its futuristic warriors and supernatural creatures battling on alien worlds. Historical games are also popular, and themes include the Napoleonic Wars of 1792–1815, World War Two, and even a fantasy game featuring Tolkien’s Middle Earth. So, after many hours of honing their skills and sharpening their wits, the Strategy Club team are now battle-ready for this weekend’s competition and we wish them luck in the challenge ahead.